William Stockwell is one who has always had his priorities in order. During his four decades at his family's firm, he often has opted to make the tough choices. 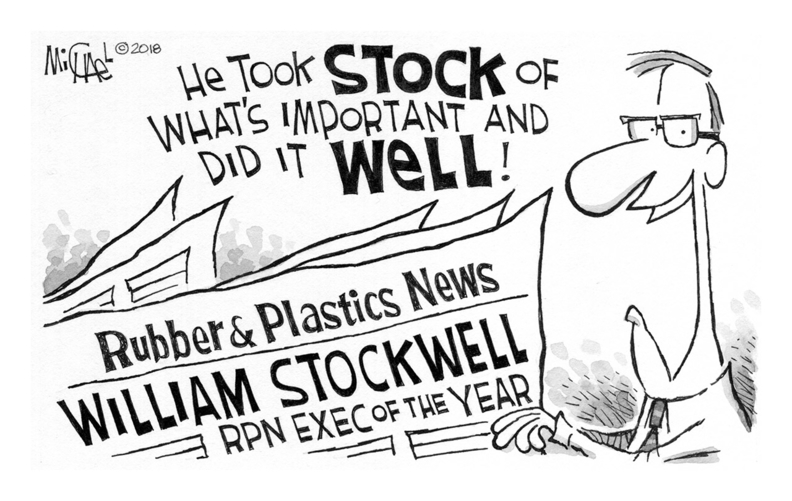 It's for that type of leadership that the president of Stockwell Elastomerics Inc. was named the Rubber & Plastics News Rubber Industry Executive of the Year, the 30th recipient of the annual honor. Stockwell Elastomerics turns 100 next year, and it's a good bet the company wouldn't be celebrating that milestone if the fourth-generation leader hadn't returned to the business in 1978 to help right what at the time was a ship in need of strong leadership. When he was named president not long after, he made choices most others in business would not have made. Rather than trying to be all things to all people, Stockwell re-tooled the firm as a focused manufacturer of rubber goods where it could stand out. When customers told him Stockwell Elastomerics had to set up in China, he refused, keeping all production domestic. He's also loyal to his hometown of Philadelphia, keeping and expanding operations locally, when a move elsewhere may have saved costs. As co-founder of Philly Manufacturing Growth Network, he is helping lead an initiative to help those in the area leaving incarceration find a good paying job. Not only does he believe in second chances, he sees it as one small way of helping solve the industry's recruitment problem. He hopes one day the network will become a bridge for ex-offenders to find work not just at Stockwell, but throughout the other affiliated members. Stockwell also supports his workers, and wants them looked after. He will turn 65 next year and has no family members in line to run Stockwell Elastomerics. But he's opted not to sell out and retire on a hefty payout, knowing the buyer—whether it be a private equity or strategic purchaser—wouldn't make what's best for the workers a top priority. That's why he has started the process of turning the business over to the work force as an ESOP. This way he knows his family's legacy will be well cared for, just as he has done for the past 40 years.